The breed originated from the Hamites of Eastern-Asia and Egypt and moved down to the present day Namibia and Angola. 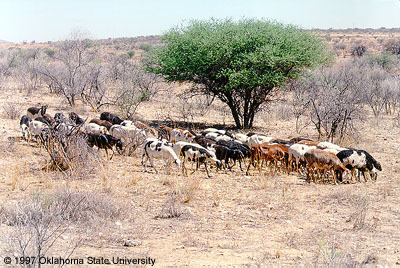 For many years the sheep were in an isolated region of Namibia and thus remained free of influence from other breeds. They are found in northwestern Namibia (Kaokoland) and southern Angola where they were herded relatively free from external influences, by the local inhabitants (Himba and Tjimba). The name of the breed was derived from the specific region where the sheep were originally encountered (then known as Gross Damaraland). Damara sheep can survive in a harsh environment and under poor nutritional conditions. The breed is exceptionally vigorous and can produce and reproduce where water and grazing is fairly restricted. This makes it very suitable for the communal areas of Namibia where extreme conditions are usually the norm rather than the exception. Research has however shown that the breed responds very well to optimum conditions. It has a fairly high resistance to most sheep diseases and also good tolerance against internal parasites. The Damara sheep has a diverse diet. It feeds on grass, bush and shrubs and can almost be classified as a browser. 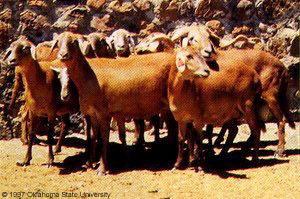 Research has indicated that up to 64% of the diet of the Damara sheep can consist of browsing material. This places the Damara in the same feeding category as goats. The mothering ability of the breed is exceptional. The ewes produce enough milk even to raise twin lambs which will occur in 5 to 10% of the births. They care well for their young and will even fight off predators when attacked by such. Orphan lambs are a rarity in the breed because of the outstanding mothering ability. It is known for example that ewes with small lambs can be transported over long distances without ending up with a single orphaned lamb. The Damara sheep is a functionally efficient animal. The ewes appear feminine, whereas the rams are more robust and masculine. It has the typical characteristics of a desert breed, namely long legs, fat tail, short hair and a respiratory rather than a cylindrical conformation. The head is of moderate length and width. The nose tends to be slightly Roman in females and more prominent in rams. The eyes are large and brownish in color, protected by well developed eyebrow-ridges. 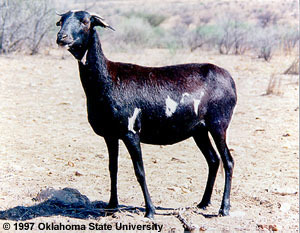 The Damara sheep is predominantly a horned sheep. Polls do however occur. the rams have well developed spiral horns which stand well away from the head. On the back of the ram's head is a well developed cushion. The ears are of moderate size and mobile. Wattles (belletjies) are sometimes found under the throat. A small dewlap is present from the chin to the throat while rams often have a dewlap stretching right down the throat. 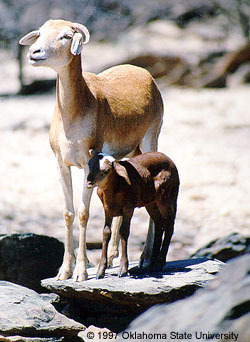 The Damara sheep is a fairly large sheep in terms of shoulder height. The body is long, oval and fairly deep. The top-line over the head is arched. It drops down in the neck, rising to the withers from where it declines slightly to rise again over well-developed loins. It then follows the line of a typical sloping rump. The legs are long and dry, but strong and well-placed. The hooves are small and well shaped. The pastern-joint is fairly long, sloping and supple. With the exception of the tail and the rear rump there is no visible localized fat. The sheep has a wide range of colors which are all equally acceptable and desirable. Pigmentation in the skin is essential and is the only prescription concerning color. Hair is mostly short with a tendency to a fine layer of woolliness developing under the hair during winter. Young sheep are inclined to have longer hair with more woolliness which they loose as they grow older. The desired covering is short glossy hair. Rams often have long hair along the throat down to the brisket. The Damara sheep has a high fertility rate, strong maternal instincts and potential to grow well under unfavorable conditions. Twin births do occur and mothers are capable of rearing them. The breed is reproductive at an early age (even as early as 8 months if conditions are favorable). Ewes can reproduce any time of the year (poly-oestrus). Photographs: Damara Breeder's Society, 1993. Damara Sheep Journal. Select Genes Ltd., Irene 1675, Republic of South Africa.